Though she tries returning to the life she knew before the accident, Pierce can't help but feel at once a part of this world, and apart from it. Yet she's never alone, because someone is always watching her. Escape from the realm of the dead is impossible when someone there wants you back. Only she can't. Because even here, he finds her. That's how desperately he wants her back. She knows he's no guardian angel, and his dark world isn't exactly heaven, yet she can't stay away, especially since he always appears when she least expects it, but exactly when she needs him most. I've always been infatuated with Greek mythology, but especially the story of Persephone and Hades. (To the point that I dressed up as Persephone's mother, Demeter, for a school project and named my guinea pig Persephone. Yes, I'm a huge dork!) I was just completely ecstatic to find out that there was going to be a young adult book based around this unique love story, but when I found out that Meg Cabot was the author I completely lost it! The main character, Pierce, just moved to Isla Huesos (a small island off the coast of Florida) with her mother for a new start after an "incident" with a teacher occurred at her last school. Although fitting into this new community isn't as easy for Pierce as her mom thinks it's going to be. Two years prior Pierce had a freak accident in a pool and died...but escaped. Abandon takes you through the aftermath of Pierce's actions after she ran away from the mysterious guy of the Underworld. I really enjoyed Pierce as a main character, she was extremely caring, almost to a fault since rescuing others put her life in danger. It was interesting to watch her try to be active in living life again and not stay trapped in her "glass coffin". I was a little confused with some of her actions though, I understand that she was trying to protect her family, but I didn't quite get why she had to befriend the popular kids and ditch her cousin to do so. Even though Pierce said she wanted nothing to do with the guy from her Near Death Experience, he kept popping up whenever she was in a dangerous situation. Until one day when Pierce goes looking for him at the cemetery where they met years ago. This guy, John, is covered in head to toe black and has a bit of an attitude problem. Pierce constantly refers to him as "wild" which I definitely agree with. I thought he was a great character that I wanted a lot more of! I didn't feel like the relationship between Pierce and John really grew, it felt a little rushed to me. Almost like they didn't really know all that much about each other, but were attracted to one another because they were complete opposites. I felt some of the time I found myself reading a lot of parts that were 'beating around the bush' about other subjects that could have been used to develop their relationship. I get the whole suspense thing, but I found myself just wanting more of Pierce and John actually together. I usually don't mind flashbacks in books, but I had a little trouble with them in Abandon. With some of them I felt like it wasn't really going all that far back in the past. It's almost like the book could have just started at the beginning and gone through a regular time line by not beginning at the move to the island. I absolutely loved the setting of Abandon! I thought Meg Cabot did a fantastic job of transporting me to Isla Huesos, I literally felt like I was there. I loved the mood that the island and its strange history provided the story. Everything from the weather, to the exotic plants and even the cemeteries made it the perfect location for the story! The ending was a perfect lead off for book two, Underworld. I definitely didn't predict what had happened, which was a pretty big surprise! I really can't wait to get my hands on the sequel! I'm really interested in where Meg Cabot plans to take Pierce's story. "I already knew what it was like to sink. I decided I might as well swim." For how much I love the myth of of Persephone I thought I would have enjoyed this book a bit more. 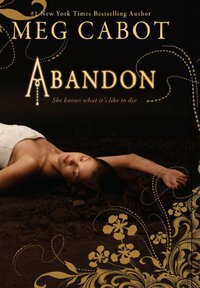 However, Meg Cabot is a pro-storyteller so I definitely recommend picking up Abandon. I think it was a great start to this trilogy and I can't wait to read the following installments which will hopefully contain developing relationships and reveal more about John's past. haha! this was a super long review but that just shows how interested you are in the subject. I had no idea that this was based on greek mythology. I have a major love-hate relationship with Meg Cabot's books and would give this one a try to see if I love it! I really enjoyed this book! I can't wait for Underworld to come out! Nice review!